I grew up in Libertyville, Illinois not far from the University of Illinois-Chicago. Some of my first memories of gymnastics came from when I was competing at the Windy City Invitational, a competition that has been hosted by UIC for the last 48 years. It was always one of the biggest competitions of the year as it drew in many gymnasts from the Midwest and beyond to compare their skills against each other in the early part of the gymnastics season. I never competed for UIC gymnastics. My collegiate career took me to Penn State University. I competed for them from 2012-2015. During my time there, the only times I got to compete against UIC was in the NCAA championships. Nonetheless, I always had friends and former teammates on the UIC team so I kept in close contact with the program. My career came to a close in 2015 when I graduated with my degree in Chemistry. Due to a shoulder injury that had plagued me my entire senior year, I thought I was done with the sport completely. 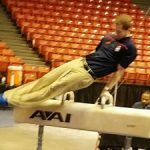 I had even attended a course to help me transition to life after gymnastics and had seen a sports psychologist because of the mental stress the injury and subsequent ending of my career had on me. Little did I know I'd find my way back to the sport. I found myself back in the Chicagoland area to finish preparing for pharmacy school for the fall of 2016. During this time, I ended up having the multiple tears in my shoulder diagnosed and fixed. 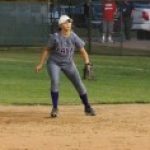 It was during my recovery in the spring of 2016, I sought to regain a connection with the sport I loved and had neglected for quite some time. When applying to Pharmacy school, I, of course, was looking at a variety of different things. But when I applied to the UIC College of Pharmacy, one thing, in particular, caught my eye; the UIC gymnastics team. The good news was that I had been accepted to every pharmacy school I applied to. As a result, I could pick my home for the next 4 years based on what I wanted and not what I needed. It was around that time I contacted UIC's head coach Charley Nelson to see if he would be okay with me coming in to work out every once in a while. He sealed my fate when he told me he would be happy to have me. Charley didn't expect me to be in the gym often or follow through with the whole coaching thing. I knew this because he told me so. Nonetheless, I consistently made it into the gym and tried to impart my knowledge of the sport on the guys that were there. This was a relatively new experience for me as I had never really been a coach. It took some time to figure out how the team functioned and the strengths and weaknesses of everyone on the team. Additionally, I had to learn how what to do during competitions as well. I think I started to have a pretty good handle on it all by the end of year one. 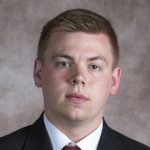 In year two, another former gymnast, Mike Wilner, wanted to help the team as well. Mostly due to an NCAA rule that you cannot have more than one volunteer assistant coach, I was elevated to be the assistant coach of the team. NCAA rule or not, I was extremely humbled by the opportunity and took my role even more seriously. I became more active in preparing our training and conditioning regimens. I arranged my school schedule in a way that allowed me to travel with the team to competitions. 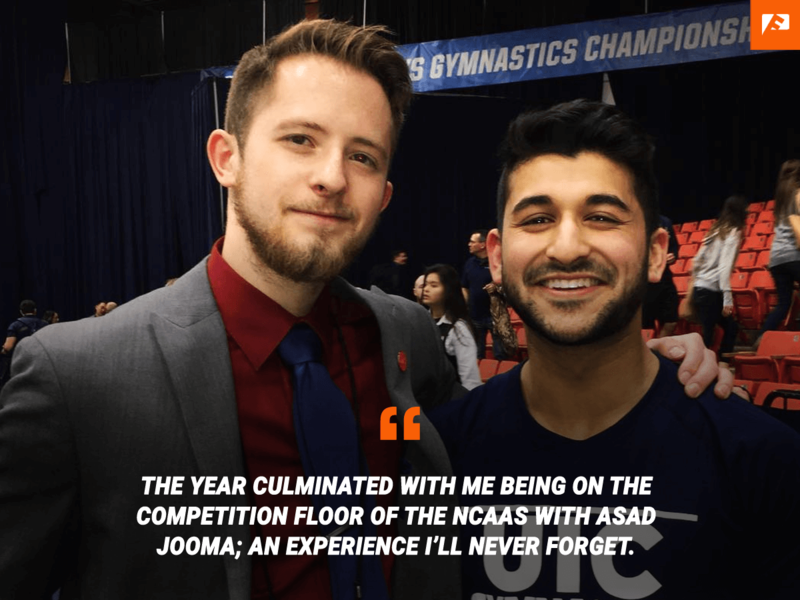 The year culminated with me being on the competition floor of the NCAAs with Asad Jooma; an experience I’ll never forget. I never competed for UIC gymnastics. So why do I care so much? ... because I wouldn’t be the person I am today without the UIC gymnastics program. I wouldn’t be in the city of Chicago, attending a premier College of Pharmacy, or succeeding in the many roles I’ve taken on in the past few years. I wouldn’t have the confidence, the leadership skills, or most importantly, the happiness I’ve experienced since involving myself with the program. And I am just one of the hundreds of people that can say the same. This is why even though I’ve never competed as a student-athlete at UIC, I’m advocating as much as possible to keep this program alive. The program’s history, the impact it has had on countless people, and the promise for continued success are more than enough reasons to not drop UIC gymnastics. I urge everyone to remain vigilant as we continue this fight to keep UIC gymnastics so that people can continue to develop under its tutelage. Even if you’ve never competed for UIC gymnastics, this is a cause you will want to support. It affects the University of Illinois at Chicago, the sport of gymnastics, and the thousands of people that enjoy either of those institutions. My name is Craig Hernandez. I never competed for UIC gymnastics but I’m fighting with all my heart to ensure UIC gymnastics is here for a long time.